Welcome back, this month we take a river cruise along the Tha Chin River between Wat Don Wai and Wat Rai Khing in Sam Phran, Nakhon Pathom. 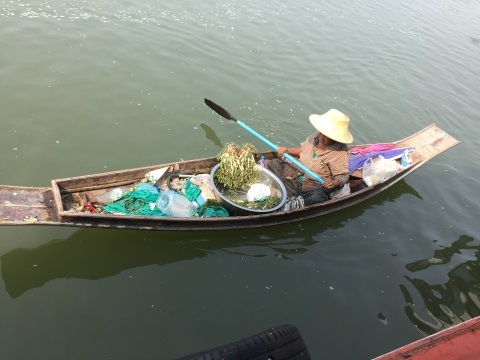 Such cruises are popular in some of the floating markets here as they let visitors do some sightseeing, feed fish in their sanctuaries or to make merit at the temples along the way. It's also a good opportunity to see the traditional way of life that still exists in some of the riverside communities. Come and join us on this river cruise. 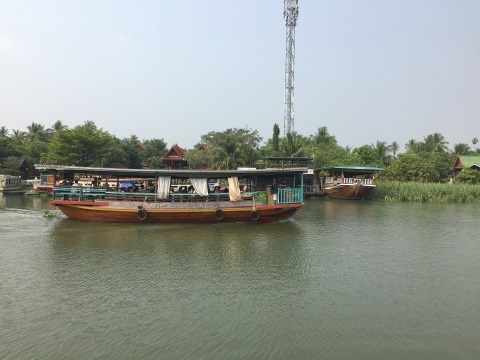 We started our river cruise from Wat Don Wai Floating Market that's famous for its food. 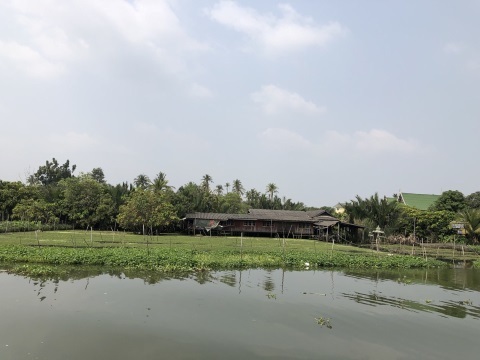 The area around Wat Don Wai has several duck farms and braised duck is a popular food sold here. You can buy these ducks from the vendors in the market to take home or visit the restaurant to have piping hot bowls of braised duck noodles before the boat trip. The ticket booth and the boat pier for the river cruise are located within the market. 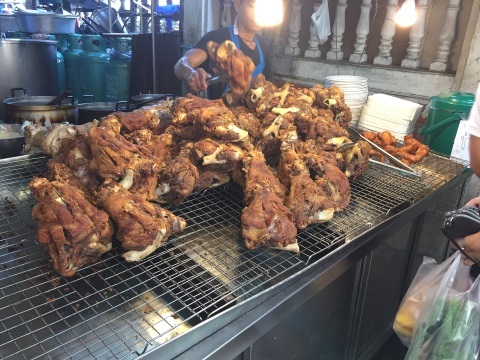 Take a stroll through the crowded market and view some of the goods on display. There are restaurants, near the ticketing booth for the river cruise, where you can order your food to be consumed on board during the trip. The boat we boarded can comfortably seat 40 passengers with dining tables. If you have pre- ordered your food, you will be served before the boat sails off. Here are some of the boat services available. Route 1 – Wat Don Wai – Wat Rai Khing and fish sanctuary, duration 1 hour, this was the route we took to get an idea of the cruise. Departure times: 1215 hours, 1330 hours. On weekdays i.e. Mondays – Fridays, only the route 1 boat service is available, timings are 1130 hours, 1245 hours, 1415 hours. Prices are the same as the weekends. Charter services are also available for making merit at 9 temples, dinner cruises, homestay on a boat house and even trips out to sea to release the cremated remains of the deceased. The boats can accommodate 15, 40. 80 and 100 passengers. For more information, please call 081 – 4488 – 876 or 081 – 6595 – 805. 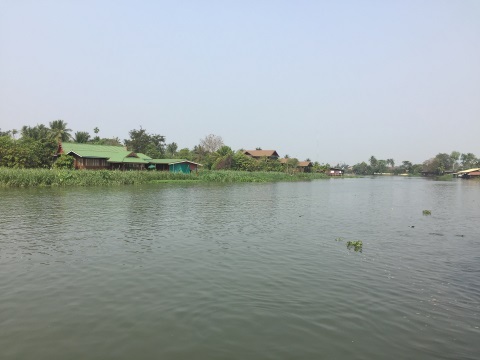 A cruise along the Tha Chin or the Nakhon Chaisi, as this stretch of the river is locally called, is a pleasant and relaxing way to spend a morning. One distinctive feature along the way is that most of the vegetable and fruit farms are located on the west bank of the river; the east bank is more urban with factories, shops or modern buildings. The vegetable farms cultivate pak kra ched or water mimosa and pak bung or morning glory. 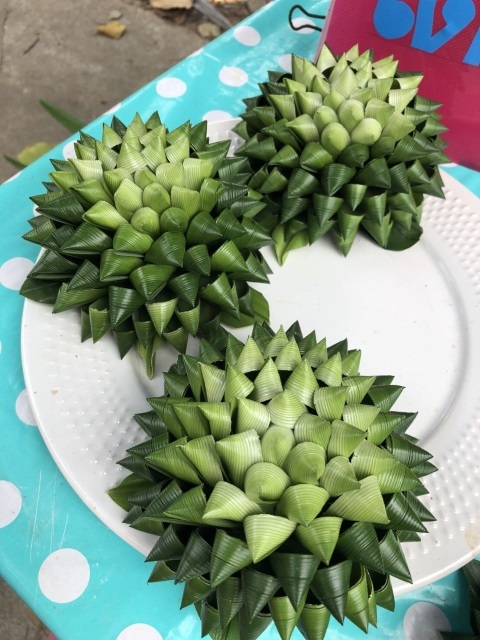 These vegetables are grown in the water and I initially mistook them for water hyacinth that we usually find in the rivers here. The Tha Chin like the Chao Phraya is a river heavy with silt flowing through a flat river basin. As a result, the river winds in very sharp bends as it flows. The current along the river is inconsistent; the current on the outer banks in a curve flows faster than the current on the inner banks. Our river cruise goes along one of these sharp horseshoe bends. 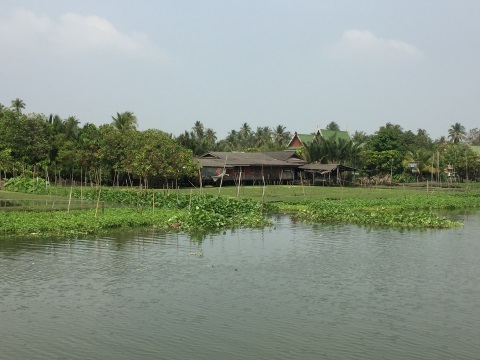 The vegetable farms are located on the inner bend where the current is slower. Even then, stakes are driven into the vegetables plots to hold down the vegetables and prevent them from drifting away with the current. 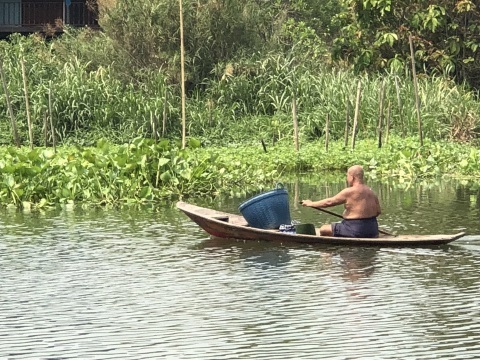 Farmer on his rounds, the vegetation in the background is water hyacinth, it can be grounded to a fine powder and used as organic fertiliser. The twine when dried can be woven into baskets and other containers. 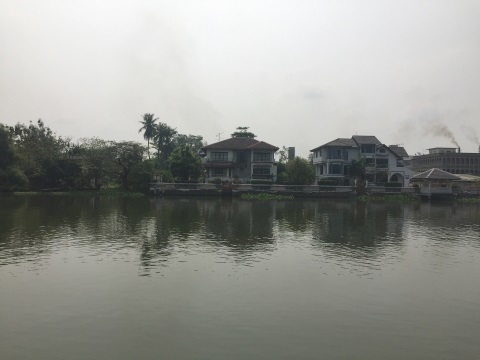 There is a mix of houses on the banks, modern, traditional and farm houses with a sprinkling of mansions belonging to some business tycoons whose names I couldn't recognise. Wat Rai Khing is an old temple built in 1791 and has a famous Buddha image with Lanna features enshrined in the temple. Besides a museum displaying old artefacts, murals and books, it has a popular fish sanctuary, like many of the temples along the Tha Chin. There are steps leading down to the river and lots of people go down there to feed the fish. 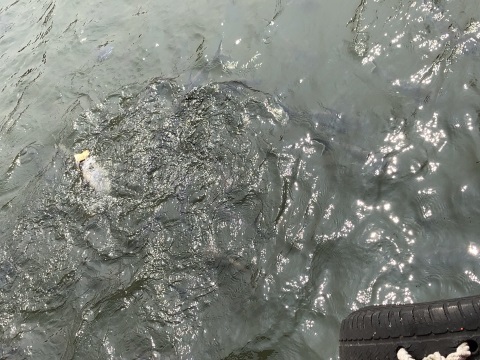 We had the luxury of feeding the fish mid-stream from our boat. 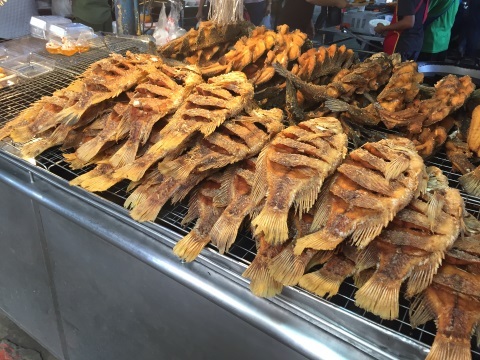 The type of fish here is pla sawai, a fish in the catfish family called striped catfish that is commonly found in the rivers in Thailand and Vietnam. The striped catfish can grow up to more than a metre or four feet long. As people are in a habit of feeding fish near the temples, these fish gather in huge shoals to wait for food. 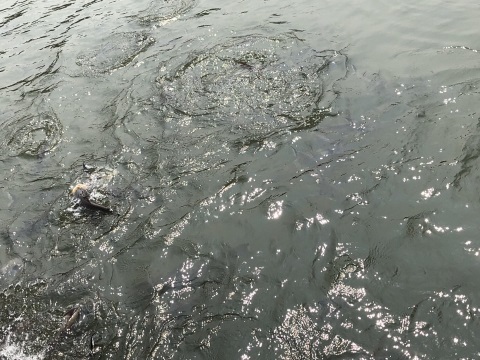 As the food consisting of bread is thrown in the water, they break the water's surface in a feeding frenzy. After this, it was time to turn around and return to the pier. 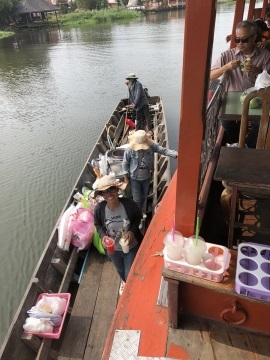 On the way back to Wat Don Wai, we had an unusual refreshment stop; an ice cream boat vendor in mid-stream selling home-made ice cream and ice-cold drinks. 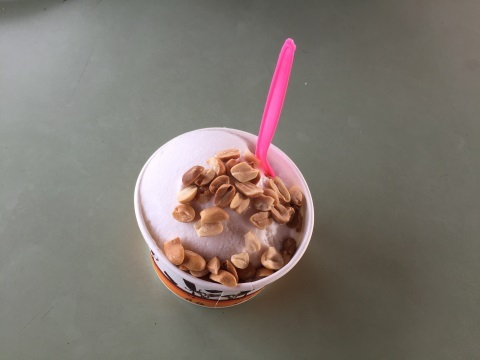 A welcome break on a hot Sunday morning. 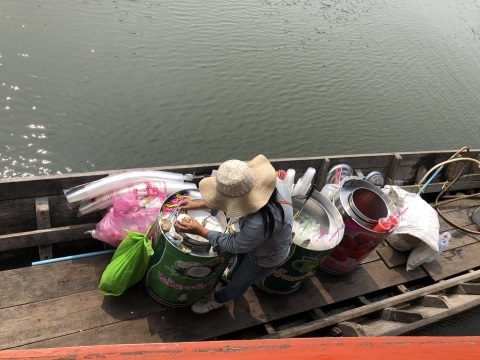 Then it was back to the pier at the Wat Don Wai Floating Market after an interesting morning outing on the Tha Chin viewing life of riverside communities. On the way out of the market, we came across a vendor displaying some very unusual pieces of art. It consists of a kaffir lime* as the core; strips of banana leaves are cut, folded and stapled. These strips are then pinned to the kaffir lime resulting in this fragrant floral design! In the process, we discovered that the vendor is the art teacher in the Wat Don Wai School. 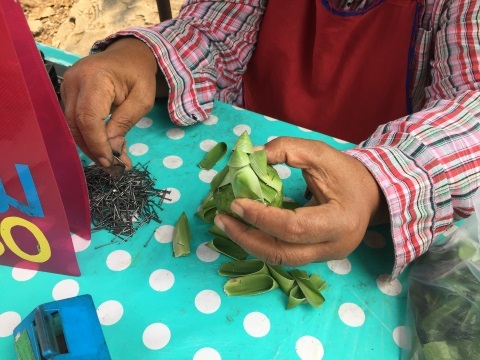 We wish her and her students all the best, may they continue to produce beautiful pieces of Thai art and craft in future to keep Thai handicraft skills alive. *Kaffir lime or citrus hystrix (Thai – makrut) is lime with a very rough outer layer or rind and a fruit reputed to have good nutrition benefits. Boromaratchachonnani Road (Highway 338) – Soi Bang Toei 2 (first turning on the left after Tesco Lotus) – Highway 3316 – Wat Don Wai Floating Market. 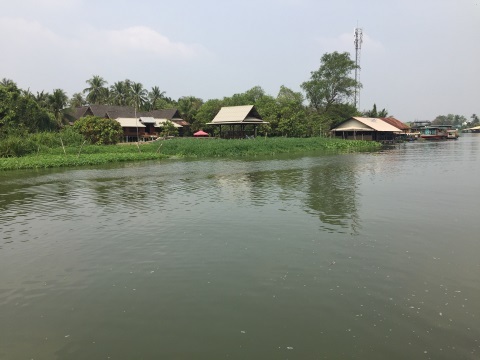 Ban Sakla the waterside community – Samut Prakarn.